The 2013 World IA Day was a huge success. Only its 2nd year in existence, and it had big crowds in 20+ locations (15 official). Congratulations to everyone involved in organizing the day, and to the intrepid board members of the IA Institute who decided to risk transforming the more US-based IDEA conference into this terrific, global, community-driven event. I was fortunate to be asked to speak at the event in Ann Arbor, MI, where I talked about how information shapes context — the topic I’ve been writing a book about for a while now. I’ll probably continue having new permutations of this talk for quite some time, but here’s a snapshot at least, describing some central ideas I’m fleshing out in the book. I’m calling this “beta 2” — since it has somewhat different and/or updated content vs the one I did for CHI Atlanta back in the fall of 2012. Video and Slides-with-notes embedded below. Enjoy! There are two things in particular that everyone struggles with on Twitter. Here are my humble suggestions as to how Twitter can do something about it. What it is: User A is following user B, but User B is not following User A. User B direct-messages User A, and when User A tries to reply to that direct message, they cannot, because User B is not following them. Fix: Give User B a way to set a message that will DM User A with some contact info automatically. Something like “Unfortunately I can’t receive direct messages from you, but please contact me at blahblah@domain.blah.” A more complicated fix that might help would be to allow User B to set an optional exception for receiving direct messages for anyone User B has direct-messaged (but whom User B is not following), for a given amount of time or a number of messages. It’s not perfect, but it will handle the majority of these occurrences. What it is: User A means to send a direct message to User B, but accidentally tweets it to the whole wide world. a) The SMS Reflex Response: User A gets a text from Twitter with a direct message from User B; User A types a reply and hits “send” before realizing it’s from Twitter and should’ve had “d username” (or now “m username” ?!?) typed before it. b) The Prefix Fumble: User A is in same situation as above, but does realize it’s a text from Twitter — however, since they’re so used to thinking of Twitter usernames in the form of “@username” they type that out, forgetting they should be using the other prefix instead. Fix: allow me to turn *off* the ability to create a tweet via SMS; and reply to my SMS text with a “hey you can’t do that” reminder if I forget I have it turned off and try doing it anyway. Let me turn it on and off via SMS text with commands, so if I’m stuck on a phone where I need to tweet that way, I can still do it. But so many people have smart-phones with Twitter apps, there’s no reason why I can’t receive SMS from Twitter without being able to create via SMS as well. To celebrate the recent publication of Resmini & Rosati’s “Pervasive Information Architecture,” I’m reprinting, here, my contribution to the book. Thank you, Andrea & Luca, for asking me to add my own small part to the work! It’s strange how, over time, some things that were once rare and wondrous can become commonplace and practically unnoticed, even though they have as much or more power as they ever had. Consider things like these: fire; the lever; the wheel; antibiotics; irrigation; agriculture; the semiconductor; the book. Ironically, it’s their inestimable value that causes these inventions to be absorbed into culture so thoroughly that they become part of the fabric of societies adopting them, where their power is taken for granted. Add to that list two more items, one very old and one very new: the map and the hyperlink. Those of us who are surrounded by inexpensive maps tend to think of them as banal, everyday objects – a commoditized utility. And the popular conception of mapmaking is that of an antiquated, tedious craft, like book binding or working a letter-press – something one would only do as a hobby, since after all, the whole globe has been mapped by satellites at this point; and we can generate all manner of maps for free from the Internet. But the ubiquity of maps also shows us how powerful they remain. And the ease with which we can take them for granted belies the depth of skill, talent and dedicated focus it takes for maps (and even mapping software and devices) to be designed and maintained. It’s easy to scoff at cartography as a has-been discipline – until you’re trying to get somewhere, or understand a new place, and the map is poorly made. Consider as well the hyperlink. A much younger invention than the map, the hyperlink was invented in the mid-1960s. For years it was a rare creature living only in technology labs, until around 1987 when it was moderately popularized in Apple’s HyperCard application. Even then, it was something used mainly by hobbyists and educators and a few interactive-fiction authors; a niche technology. But when Tim Berners-Lee placed that tiny creature in the world-wide substrate of the Internet, it bloomed into the most powerful cultural engine in human history. One has to ask, however, what good would any of the apps, mobile devices and augmented reality be without digital links? Where these well-meaning people go wrong is to assume the hyperlink is just a homely little clickable bit of text in a browser. The browser is an effective medium for hyperlinked experience, but it’s only one of many. The hyperlink is more than just a clicked bit of text in a browser window — it’s a core element for the digital dimension; it’s the mechanism that empowers regular people to point across time and space and suddenly be in a new place, and to create links that point the way for others as well. Once people have this ability, they absorb it into their lives. They assume it will be available to them like roads, or language, or air. They become so used to having it, they forget they’re using it — even when dazzled by their shiny new mobile devices, augmented reality software and touch-screen interfaces. They forget that the central, driving force that makes those technologies most meaningful is how they enable connections — to stories, knowledge, family, friends. And those connections are all, essentially, hyperlinks: pointers to other places in cyberspace. Links between conversations and those conversing — links anybody can create for anybody to use. This ability is now so ubiquitous, it’s virtually invisible. The interface is visible, the device is tangible, but the links and the teeming, semantic latticeworks they create are just short of corporeal. Like gravity, we can see its physical effects, but not the force itself. And yet these systems of links — these architectures of information — are now central to daily life. Communities rely on them to constructively channel member activity. Businesses trust systems of links to connect their customers with products and their business partners with processes. People depend on them for the most mundane tasks — like checking the weather — to the most important, such as learning about a life-changing diagnosis. In fact, the hyperlink and the map have a lot in common. They both describe territories and point the way through them. They both present information that enables exploration and discovery. But there is a crucial difference: maps describe a separate reality, while hyperlinks create the very territory they describe. Each link is a new path — and a collection of paths is a new geography. The meaningful connections we create between ourselves and the things in our lives were once merely spoken words, static text or thoughts sloshing around in our heads. Now they’re structural — instantiated as part of a digital infrastructure that’s increasingly interwoven with our physical lives. When you add an old friend on a social network, you create a link unlike any link you would have made by merely sending a letter or calling them on the phone. It’s a new path from the place that represents your friend to the place that represents you. Two islands that were once related only in stories and memories, now connected by a bridge. Or think of how you use a photograph. Until recently, it was something you’d either frame and display on a shelf, carry in your wallet, or keep stored in a closet. But online you can upload that photo where it has its own unique location. By creating the place, you create the ability to link to it — and the links create paths, which add to the the ever-expanding geography of cyberspace. Another important difference between the hyperlinks and traditional maps is that digital space allows us to create maps with conditional logic. We can create rules that cause a place to respond to, interact with, and be rearranged by its inhabitants. A blog can allow links to add comments or have them turned off; a store can allow product links to rearrange themselves on shelves in response to the shopper’s area of interest; a phone app can add a link to your physical location or not, at the flick of a settings switch. These are architectural structures for informational mediums; the machinery that enables everyday activity in the living web of the networked dimension. The great challenge of information architecture is to design mechanisms that have deep implications for human experience, using a raw material no one can see except in its effects. It’s to create living, jointed, functioning frameworks out of something as disembodied as language, and yet create places suitable for very real, physical purposes. Information architecture uses maps and paths to create livable habitats in the air around us, folded into our daily lives — a new geography somehow separate, yet inseparable, from what came before. A while back, I posted a rant about information architecture that invoked the term “cyberspace.” I, of course, received some flack for using that word. It’s played out, people say. It invokes dusty 80s-90s “virtual reality” ideas about a separate plane of existence … Tron-like cyber-city vistas, bulky goggles & body-suits, and dystopian worlds. Ok…yeah, whatever. For most people that’s probably true. Over the last 20 years or so, we’ve managed to cause the emergence of a massive, global, networked dimension of human experience, enabled by digital technology. It’s the dimension brave, unhappy citizens of Libya are “visiting” when they read, in real-time, the real words of regular people in Tunisia and Egypt, that inspire them to action just as powerfully as if those people were protesting right next to them. It may not be the dimension where these people physically march and bleed, but it’s definitely one dimension where the marching and bleeding matter. This dimension isn’t carbon-based, but information-based. It’s specifically human, because it’s made for, and bound together with, human semantics and cognition. It’s the place where “knowledge work” mostly happens. But it’s also the place where, more and more, our stories live, and where we look to make sense of our lives and our relationships. What do we call this thing? Back in 2006, Wired Magazine had a feature on how “Cyberspace is Dead.” They made the same points about the term that I mention above, and asked some well-known futurist-types to come up with a new term. But none of the terms they mentioned have seemed to stick. One person suggests “infosphere” … and I myself tried terms like “infospace” in the past. But I don’t hear anyone using those words now. Even “ubiquitous computing” (Vint Cerf’s suggestion, but the late Mark Weiser’s coinage) has remained a specialized term of art within a relatively small community. Plus, honestly, it doesn’t capture the dimensionality I describe above … it’s fine as a term for the activity of “computing” (hello, antiquated terminology) from anywhere, and for reminding us that computing technology is ubiquitously present, but doesn’t help us talk about the “where” that emerges from this activity. There have been excellent books about this sort of dimension, with titles like Everyware, Here Comes Everybody, Linked, Ambient Findability, Smart Things … books with a lot of great ideas, but without a settled term for this thing we’ve made. Of course, this begs the question: why do we need a term for it? As one of the people quoted in the Wired article says, aren’t we now just talking about “life”? Yeah, maybe that’s OK for most people. We used to say “e-business” because it was important to distinguish internet-based business from regular business … but in only a few years, that distinction has been effaced to meaninglessness. What business *isn’t* now networked in some way? Still, for people like me who are tasked with designing the frameworks — the rule sets and semantic structures, the links and cross-experiential contexts, I think it’s helpful to have a term of art for this dimension … because it behaves differently from the legacy space we inherited. It’s important to be able to point at this dimension as a distinct facet of the reality we’re creating, so we can talk about its nature and how best to design for it. Otherwise, we go about making things using assumptions hardwired into our brains from millions of years of physical evolution, and miss out on the particular power (and overlook the dangers) of this new dimension. So, maybe let’s take a second look at “cyberspace” … could it be redeemed? We are creating a new kind of reality, one in which physical and digital environments, media, and interactions are woven together throughout our daily lives. In this world, the virtual and the physical are seamlessly integrated. Cyberspace is not a destination; rather, it is a layer tightly integrated into the world around us. Personally, I think Gibson sees the neon-cyberpunk-cityscape, virtual-reality conception of cyberspace as pretty far off the mark. In articles and interviews I’ve read over the years, he’s referenced it on and off … but seems conscious of the fact that people will misunderstand it, and finds himself explaining his points with other language. Frankly, though, we haven’t listened closely enough. In the same magazine as the “Cyberspace is Dead” article, seven years prior, Gibson posted what I posit to be one of the foundational texts for understanding this… whatever … we’ve wrought. It’s an essay about his experience with purchasing antique watches on eBay, called “My Obsession.” I challenge anyone to read this piece and then come up with a better term for what he describes. In Istanbul, one chill misty morning in 1970, I stood in Kapali Carsi, the grand bazaar, under a Sony sign bristling with alien futurity, and stared deep into a cube of plate glass filled with tiny, ancient, fascinating things. Hanging in that ancient venue, a place whose on-site café, I was told, had been open, 24 hours a day, 365 days a year, literally for centuries, the Sony sign – very large, very proto-Blade Runner, illuminated in some way I hadn’t seen before – made a deep impression. I’d been living on a Greek island, an archaeological protectorate where cars were prohibited, vacationing in the past. The glass cube was one man’s shop. He was a dealer in curios, and from within it he would reluctantly fetch, like the human equivalent of those robotic cranes in amusement arcades, objects I indicated that I wished to examine. He used a long pair of spring-loaded faux-ivory chopsticks, antiques themselves, their warped tips lent traction by wrappings of rubber bands. And with these he plucked up, and I purchased, a single stone bead of great beauty, the color of apricot, with bright mineral blood at its core, to make a necklace for the girl I’d later marry, and an excessively mechanical Swiss cigarette lighter, circa 1911 or so, broken, its hallmarked silver case crudely soldered with strange, Eastern, aftermarket sigils. And in that moment, I think, were all the elements of a real futurity: all the elements of the world toward which we were heading – an emerging technology, a map that was about to evert, to swallow the territory it represented. The technology that sign foreshadowed would become the venue, the city itself. And the bazaar within it. But I’m glad we still have a place for things to change hands. Even here, in this territory the map became. Names are important, powerful things. We need a name for this dimension that is the map turned out from itself, to be its own territorial reality. I’m not married to “cyberspace” — I’ll gladly call it something else. What’s important to me is that we have a way to talk about it, so we can get better at the work of designing and making for it, and within it. Note: Thanks to Andrea Resmini & Luca Rosati for involving me in their work on the upcoming book, Pervasive IA, from which I gleaned the reference to the Institute for the Future article I mentioned above. 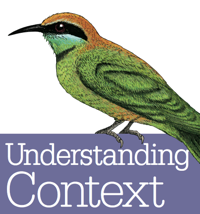 Earlier I shared a post about designing context management, and wanted to add an example I’d seen. I knew I’d made this screenshot, but then couldn’t remember where; luckily I found it today hiding in a folder. This little widget from Plaxo is the only example I’ve noticed where an online platform allows you to view information from different contextual points of view (other than very simple examples like “your public profile” and “preview before publish”). Plaxo’s function actually allows you to see what you’re sharing with various categories of users with a basic drop-down menu. It’s not rocket science, but it goes miles further than most platforms for this kind of functionality. If anybody knows of others, let me know? Explain IA and win a thousand bucks! In this contest, you are invited to explain information architecture. What is it? Why is it important? What does it mean to you? Some folks may offer a definition in 140 characters or less, while others will use this opportunity to tell a story (using text, pictures, audio, and/or video) about their relationship to IA. Our goals are to engage the information architecture community (by fostering creativity and discussion) and advance the field (by evolving our definitions and sharing our stories). We believe this can be a positive, productive community activity, and a whole lot of fun. We hope you do too! I suspect the contest would come across that way only if you’re already predisposed to think negatively of IA as a practice or the Institute as an organization — or people who self-identify as “Information Architects” in general. This post isn’t addressed to those folks, because I’m not interested in trying to sway their opinions — they’re going to think what they want to think. But just in case others may be wondering what’s up, here’s the deal. Information architecture is a relatively new community of practice. As technology and the community evolve, so does the understanding of this term of art. For some people, IA is old hat — a relic of the days when websites were mere collections of linked text files. For others, IA represents an archaic, even oppressive worldview, where only experts are allowed to organize and label human knowledge. Again, I think these views of IA say more about the people who hold them than the practice of IA itself. But for the rest of us, this contest is just an opportunity to celebrate the energetic conversations that are already happening anyway — and that happen within any vibrant, growing community of practice. It’s a way to spotlight how much IA has evolved, and bring others into those conversations as well. Of course, the Institute is interested in these expressions as raw material for how it continues to evolve itself. But why wouldn’t any practitice-based organization be interested in what the community has to say about the central concern of the practice? I’m looking forward to what everyone comes up with. I’m especially excited to learn things I don’t know yet, and discover people I hadn’t met before. So, go for it! Explain that sucker! Congratulations to Andrea Resmini and all the hardworking, brilliant people who just launched the Journal of Information Architecture. I’m not saying this just because I’m fortunate enough to have an article in it, either. In fact, I hope my tortured prose can live up to the standard set by the other writers. About my article, “The Machineries of Context” [PDF]. In the article, I try explaining why I think Information Architecture is kind of a big deal — how linking and creating semantic structures in digital space is an increasingly challenging, important practice in the greater world of design. In essence, re-framing IA to help us see what it has been all along. Update: The Information Architecture Institute was kind enough to publish an Italian translation of the article.